Shichirui is written with different characters in the Fudoki along with the entry, "There is a shrine in the south and dwellings in the north. It has an anchorage capacity of thirty boats." It is said to be the northernmost harbor of the Shimane Peninsula. The shrine, Shichirui, is still enshrined to the right when approaching from Shichirui on the 485 road. A puzzle is the poem's mention of the old shrine name of 'Kita-daimyoujin'. The Unyoshi documents on Shichirui-ura only refer to the shrines Miho-myoujin and Kuniyoshi-myoujin. 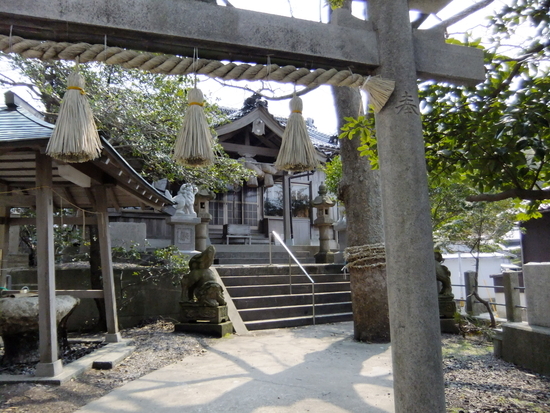 The Meiji period Imperial records only list Shichirui jinja (shrine) and Miho jinja, perhaps suggesting that by that time, Kuniyoshi had already become the Shichirui of the Fudoki entry. Of interest, is the fact that Kanezaki Junpei who visited Shichirui in 1863 has recorded the shrine there as being named, ' Kokushi-daimyoujin'- is this perhaps Kuniyoshi with the aforementioned Kita Daimyoujin having had an alternative name of Kuniyoshi (Kokushi)? Furthermore, , Kishizaki Tokiteru in his records from the start of the Edo era lists the shrine with characters that can also be read as 'kita' perhaps having a connection point with the aforementioned 'Kita'. Omura Washiro, who visited the area in 1866 , records worshipping at a Miho daimyoujin of Nada no miya, and later at the top of a mountain lists an 'Ue no miya' (Upper shrine) as Kunishi-daimyoujin. The current Shichirui-jinja is clearly an 'Ue no miya', in other words Kunishi-daimyoujin, and maybe Kita-daimyoujin. The records compiled by Mihonoseki town describe it perhaps more effectively as Kitagatan, showing the historical development of the word 'Kita' in relation to this area. Furthermore, the enshrined deity, Mihotsu hime-no-kami is thought to have been originally enshrined in Miho-myoujin shrine that became joined with Shichirui shrine in 1909. While the actual name can no longer be seen, traces of it remain in the former shrine address of the area on the opposite shore from Shichiura harbor, 'Miya-ura'. Shichiura shrine is located like a gateway to the World Geopark-designated site Oki Island. Head towards Shichiura harbor on the Mihonoseki prefectural road, turn right at the convenience store keeping the Matsue Police headquarters on the left and go north down the tunnel. The shrine is close to the turning for the harbor. This shrine's New Year festival, which is held around January 3rd, seems a fun occasion with children holding aloft red flags while Toshitokujin is paraded in a mikoshi bumping quite forcefully in greeting with other mikoshi from nearby areas. During the festival, the leaders take turns with their duties in groups of six and when doing so patrol the streets with arms linked, their faces decorated with ink. Meanwhile, local children gather in the mikoshi prayer area and after having lunch, are able to share out and take home the mountain of treats gathered by the adults in the town. Up to a decade ago, children used to actually stay overnight at the shrine sleeping in a huddle. For kids back then, this would have been not only a much anticipated event, but spending a night away from home would surely have been a unique, thrilling experience. As part of the festival, three kinds of food are given in offering to the enshrined deity: shopped up 'arame' seaweed and daikon (radish) which is very good for digestion and the root vegetable taro, which when molded into round balls look very appetizing. 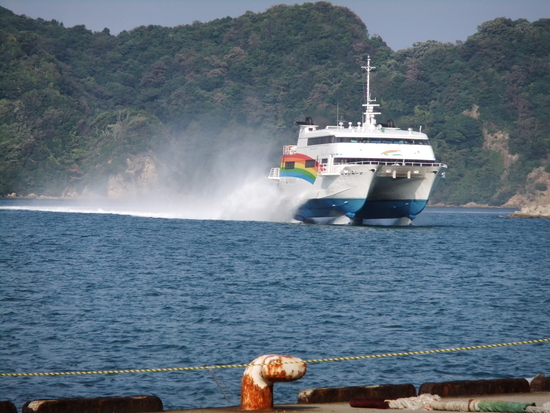 Heading east from the shrine leads to the high speed ferry terminal for Oki Island. The terminal is also home to the Meteor Plaza. With facilities such as a heated pool, it is a popular gathering place for local youth these days. However, not too far away to the west of the mountain on Shichichi-ura is a memorial to the meteor that fell on a house near Meijima shrine in Sozu ura one December 20 years previously.